What if your TV set could do more than provide you and your family with entertainment? And, no, I’m not talking about using it for Skype or any other communication or social media efforts. That’s all pretty passé at this point. But what if your television could actually safeguard you from carriers of infectious diseases, whether it’s on or off? Would you be interested in a set that offered this added perk of keeping pesky, disease-carrying insects at bay — especially now that the Zika virus has found its way to the Southeastern part of the United States? Well, LG India thinks so. South Korea’s LG is the maker of phones and a variety of other electronics popular with consumers. Most of them are designed and developed with the goal of making our lives easier or for entertainment purposes, but now they’ve purportedly found a way to merge the entertainment device with pest control — I’m serious as a heart attack. While the concept is unusual, it’s actually pretty clever, especially for consumers living in parts of the world where mosquitoes carry with them a variety of diseases, such as malaria, dengue, the equine virus, Zika and others. There’s only one catch, though, and that is the sets are currently only available in India, the Philippines and Sri Lanka. Using LG’s “mosquito-away technology,” the sets are said to repel insects using ultrasonic waves, which humans are unable to hear but allegedly cause mosquitoes to flee. The new devices became available to the public in India a few weeks ago using the same technology that has been used by LG in some of their air conditioners and washing machines. The mosquito-away technology has purportedly been certified as effective by an independent laboratory located near Chennai, India. The principle of the technology sounds like the plug-in gizmos as seen on TV that have been around for decades claiming to rid your home of pests using high frequency waves audible only to rodents and roaches. 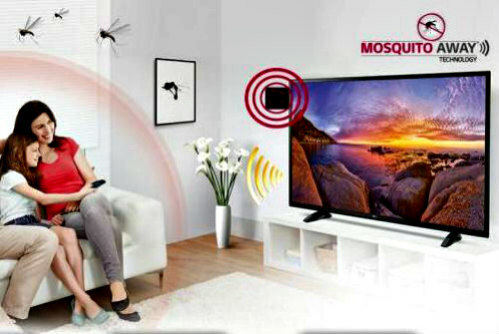 According to LG, "The ultrasonic sound waves effectively drive away the mosquitoes keeping your loved ones absolutely safe at home. Since no harmful chemicals are used, it is also odor-free and not hazardous to health, like the conventional methods used for keeping mosquitoes away." If it works, it’s good news for India, because mosquitoes are a major health hazard in the country, where over 10,500 cases of dengue fever were reported last year in the capital alone. Designed and produced in India, the initial release price for the two models said to be available is between $400 and $700 in U.S. currency. LG India has noted on their Website that the sets are not intended to be a sole source of mosquito protection. In other words, they should be considered as just one of the weapons in your arsenal for stopping the pests. There’s no word yet on if or when the TVs will be making an appearance in other parts of the world, but it seems likely — especially with South America’s current problem with the Zika virus and its inevitable spread. 100 Zipper Dress: One Clothing Item With A New Fashion For Each Day!